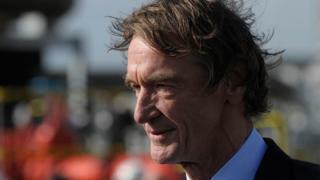 Britain's richest man, Jim Ratcliffe, has announced £1bn worth of investments in the UK oil and chemical industries. Mr Ratcliffe's company, Ineos, will spend £500m on overhauling the Forties pipeline system, which transports 40% of the UK's North Sea oil and gas. It will also build a £350m energy plant at Scotland's Grangemouth oil refinery site, which it already owns, as well as a £150m chemicals plant in Hull. Mr Ratcliffe said the investment programme would "ensure that our UK assets continue to be world-class for many years to come". He added: "At an uncertain moment for the country, Ineos has confidence in its businesses and is committed to continue investing in manufacturing and high-skilled jobs in the UK." The Forties pipeline project would "extend the life of the pipeline by at least 20 years, into the 2040s", the firm said. Mr Ratcliffe, whose £21bn fortune makes him the UK's richest man according to the Sunday Times rich list, has traditionally invested in speciality chemicals businesses, but began acquiring North Sea assets in 2015.